Up to Office 2007, the default font in Word was Times Roman Numeral and most people had gotten pretty used to that. In Word 2007, Microsoft decided to get fancy and change the font to a smoother and curvier Calibri. I have to admit it does look nice, but that’s not necessarily what you want if you’re writing term papers in college or your final thesis. Then you have to follow MLA standards, etc. So here’s how you can change the default font in Word so that you don’t have to change it manually every time your start up the program. Open Word and make sure you are on the Home ribbon. You should see the Font section second from the far left. Now click on the small arrow at the bottom right of that box. This will bring up the full font configuration dialog box. 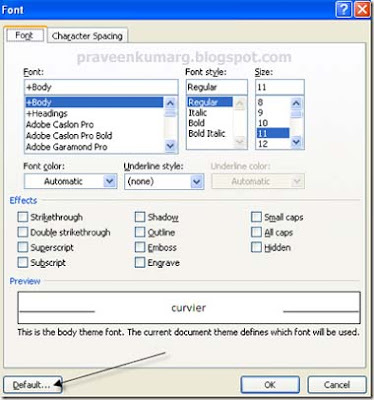 Here you can change any of the settings associated with a particular font, including the character spacing and effects. At the bottom, you’ll see the button Default. You can change the font, font style, size and other effects to your desired settings and then press the Default button to set those options as the default to be used whenever you start a new document. Changing any default setting in Word is simply saving those changes in the NORMAL template, a special Word file that is used as the base (skeleton) for all new documents. That’s all you have to do! Enjoy!